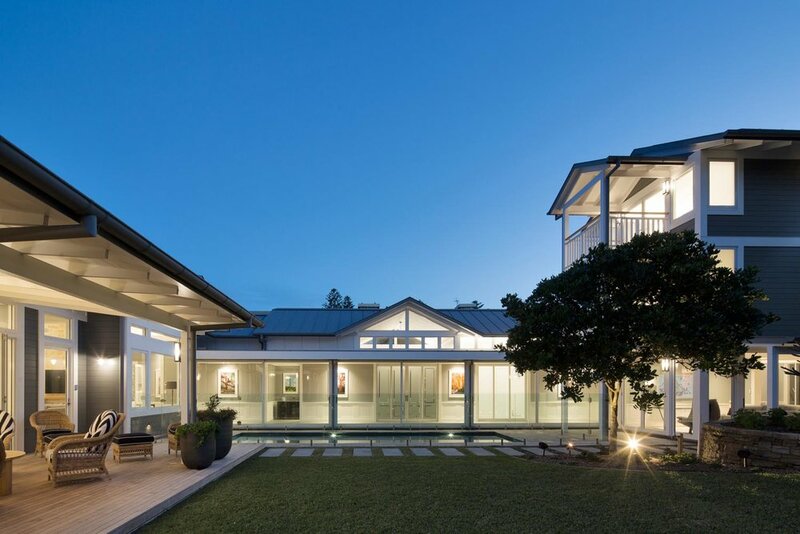 Located on a large double block frontage onto one of Sydney’s popular northern beaches, this contemporary refurbishment of an existing weatherboard Japanese pavilion-style beach house and separate guest accommodation tower, sees it’s interiors and exteriors upgraded selectively in the coastal ‘Hamptons’ style, synonymous with its coastal environment location. Enjoying spectacular views over Basin Beach towards the North Mona Vale Headland Reserve, the two existing timber dwellings were completely rebuilt to ensure an enduring robust and waterproof existence amongst its harsh marine environment. Refurbishment allowed for the enlargement of both the kitchen and sitting room between the two main beachfront pavilions. Extensive lower and upper accent wall panelling was also added throughout as per the ‘Hamptons’ aesthetic.